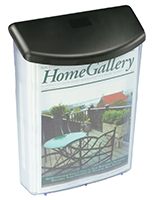 Do you need an outdoor magazine rack to display promotional literature out of doors? 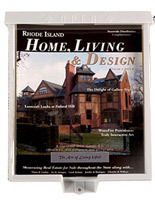 Look no further than this line of trifold holders with lids offered at wholesale prices. These single-pocket enclosed dispensers are the ideal way to dispense flyers and pamphlets for potential customers in parks, community centers or just outside your office or business. 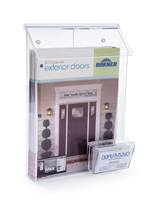 The fully enclosed acrylic boxes are designed to protect your printed items while encouraging passersby to "take one" from the assortment of magazines or leaflets inside. 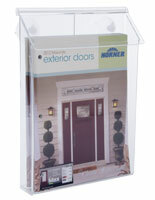 The clear design of these outdoor magazine racks allows customers to see directly inside without having to open the lid. Each weatherproof dispenser has a top closure to prevent rain, dust and dirt from getting inside. The outdoor magazine rack, also known as outside literature box, allows business to advertise 24/7 without additional man power! 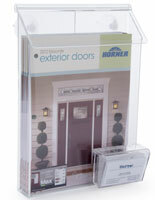 Simply attach the promotional leaflet holders to a wall, bench, pole, or door window, and let this little fixture do all the work! Each lightweight outdoor magazine rack takes only a second to set up. Where can these outside literature boxes be used? Place an outdoor magazine rack near an exterior business or office door to encourage customers to take a pamphlet on their way in or out of the building. Make the most of advertising space by placing an exterior pamphlet dispenser in parks, playgrounds or community gardens to promote your brand or company. 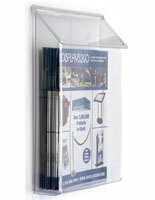 Lidded brochure dispensers are also great for promoting school and college events, or announcing new programs. Provide students with scheduling information about clubs and organizations without having to have a staff person hand them out individually. Place the weatherproof boxes in amusement parks to provide guests with maps or park information and other directionals and save money on hiring meeters and greeters! 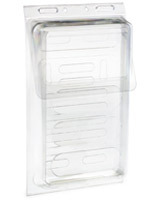 These enclosed dispensers are sold in an array of styles to suit all of your business publication dispensing needs. Choose plain boxes or one with a with the words “Take One” imprinted on the lid to encourage guests and customers to reach for a flyer or catalog. 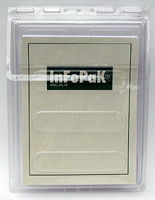 In addition, some of our models come with a business card holder on the outside for dispensing contact information. Enjoy big savings on these already inexpensive exterior trifold dispensers for advertising out of doors when you order in bulk!